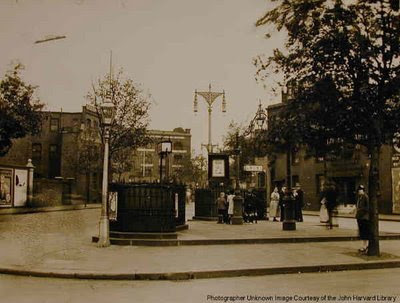 The triangular island at the junction of Tower Bridge Road and Grange Road, looking north. In the background it is possible to make out a warehouse carrying the 'Rankin Bros' identity. Rankin Bros were importers of cork and occupied premises in the middle of what is now the redeveloped Bermondsey Sq and also on Bermondsey St and in Tanner St.
A close-up view of the notice-board in the centre of the image is available here. The notice-board reflects the then Bermondsey Borough Council's commitment to public health. Thanks for doing this Niall. The city is constantly reinventing itself and I for one love to learn and see more about how the present is connected to the past. There's a Rankin building on Bermondsey St, is it related? Do you know anything about the Thomson Bros Paper firm that still has a painted sign on one of the buildings at the top end of B street? Yes, I believe that this was the same Rankin company. They also occupied 4 Tanner St at one time although in latter years they were only on Bermondsey St. I always remember seeing Eugene Atget's photographs of Paris and thinking that it was so great to be able to walk Paris holding one of Atget's books and see the city as it was 100 years ago. This is my own contribution.